By default, Blackphone only allows installation of new apps from the Google Play store. Occasionally, however, you may need to install an app without using one of the app stores. This will require you to enable the installation of apps from unknown sources. In Security Center, select the space in which you would like to allow apps from unknown sources. Security Center will warn you that installing apps from unknown sources leaves you and your personal data more vulnerable to attack. If you wish to proceed, tap YES. If you select “Enabled,” installation from unknown sources will remain enabled indefinitely, and you will need to manually re-enter Security Center to disable it again. This option is NOT recommended, as it is very easy to forget to disable the setting when you are finished installing apps. This can leave your device vulnerable. 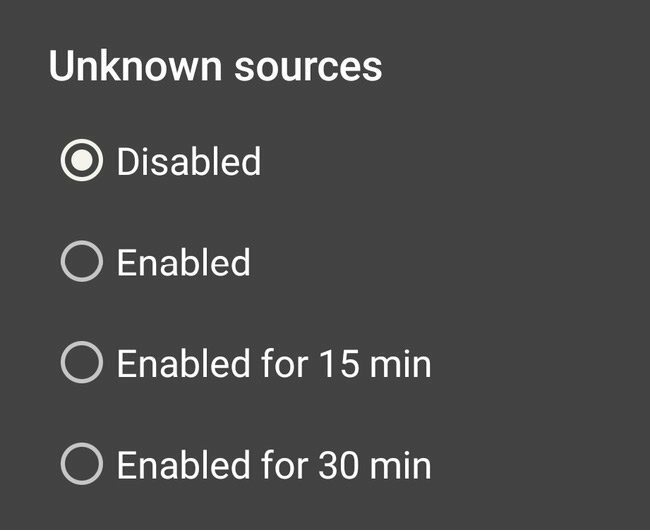 If you select “Enabled for 15 min” or “Enabled for 30 min,” Security Center will allow the installation of applications from unknown sources for 15 or 30 minutes, respectively, then automatically disable the setting. A notification will appear in your system tray while the setting is enabled, telling you how much longer it will be enabled. Using one of these settings is recommended when you must enable installation from unknown sources.